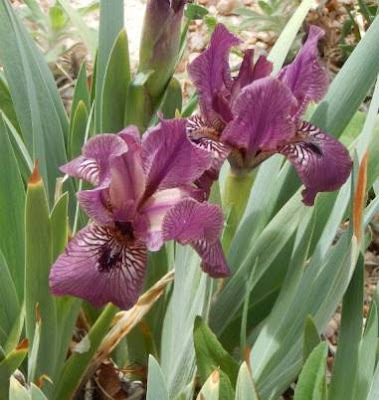 If you're even a little interested in arils and arilbreds, you will have noticed that there is a rather bewildering array of terms used to describe them in catalogs, in iris society publications, and in general use among iris growers. In today's post, I hope to help make sense of it all. The most important distinction of all is that between arils and arilbreds. By today's definition, an aril is a species from the oncocyclus or Regelia sections, or a hybrid derived only from these two groups of species. 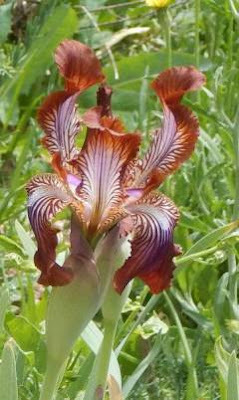 In contrast, an arilbred is a hybrid derived from both arils and ordinary bearded irises (whether tall bearded, median, or dwarf). Although this seems pretty easy, and these definitions have been official for more than half a century, one still often hears people casually refer to both arils and arilbreds as "arils". This creates a truly unfortunate confusion, especially since arilbreds differ from arils in both appearance and cultural requirements. To emphasize the distinction, you will sometimes hear people speak of "pure arils" to clarify that they are not talking about arilbreds. Aril hybrids are hybrids whose ancestry is only oncocyclus, Regelia, or both. A hybrid with only oncocyclus ancestry is an oncocyclus hybrid (OH), one with only Regelia ancestry is a Regelia hybrid (RH). Simple enough. But there are two terms in use for hybrids that are a mixture of oncocyclus and Regelia: regeliocyclus (RC) and oncogelia (OG). Originally, these terms indicated whether the cross used to produce the hybrids was Regelia x oncocylcus or oncocyclus x Regelia, but that turned out to be an unhelpful distinction. The appearance of the flowers doesn't depend on which direction the cross is made, and once you have advance-generation hybrids, the distinction is impossible to maintain. Today, we use RC to refer to aril hybrids where the Regelia influence is predominant (these are typically 1/2 Regelia or more by ancestry, but it really depends on the appearance of the flower, not the details of the pedigree). OG, naturally, refers to a hybrid where the oncocyclus influence is predominant. Long ago, people used the word "arilbred" to refer to any iris with both aril and bearded ancestry, regardless of how little aril ancestry or aril flower characteristics it had. Today we know that inheritance is through chromosome sets, and a set of chromosomes is usually either passed on to a hybrid as a complete set or not at all. So many older "arilbreds" that were 1/8 or 1/16 aril by ancestry really had no aril content at all! 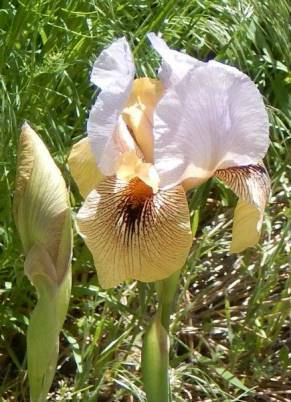 One of the first initiatives of the Aril Society International after it was formed in the late 1950s was to restrict the definition of arilbreds to irises with significant aril ancestry and significant aril appearance. 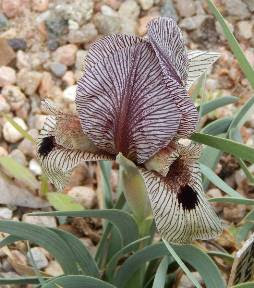 Today, to be classified as an arilbred, an iris must be at least 1/4 aril by chromosome complement and the flower must show at least two aril characteristics, such as signal or veining. This definition helps protect the distinctiveness of arilbreds as a class. Another initiative of the Aril Society was to encourage hybridizers to work with arilbreds that had more aril content and appearance. A separate category was created for arilbreds that are at least 1/2 aril, and these are eligible for a special award, the Clarence G. White Medal. Those less than 1/2 aril are eligible for the William Mohr Medal instead. Unfortunately, there is no simple terminology to distinguish these two categories; you just have to say "less than 1/2 aril" and "1/2 aril or more". One peculiarity of this division is that aril hybrids (pure arils) are also eligible for the C. G. White Medal, because not enough of these are produced or widely grown to merit their own system of awards. I think this has contributed in a small way to the confusion between arils and arilbreds - for a number of years, the American Iris Society used the abbreviation "AR" for both arils and arilbreds eligible for the C. G. White Medal, and "AB" for arilbreds eligible for the William Mohr Medal. 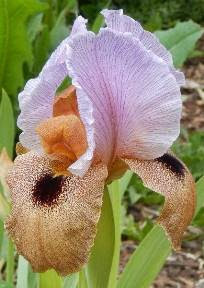 Although for awards purposes, the American Iris Society sorts all arilbreds into only two classes (less than 1/2 aril and 1/2 or more aril), the Aril Society uses a more detailed system of categories that tracks not only the amount of aril content, but also the type of aril content (oncocyclus, Regelia, or both). An arilbred with only oncocyclus and bearded ancestry is an oncobred (OB). One with only Regelia and bearded ancestry is a regeliabred (RB). If both oncocyclus and Regelia ancestry are present, it is an oncogeliabred (OGB). This is by far the largest category. If the arilbred has less than 1/2 aril content, it is marked with a "-" sign. If more than 1/2, with a "+" sign. If it has 1/2 aril content exactly, neither a "-" or "+" is used. 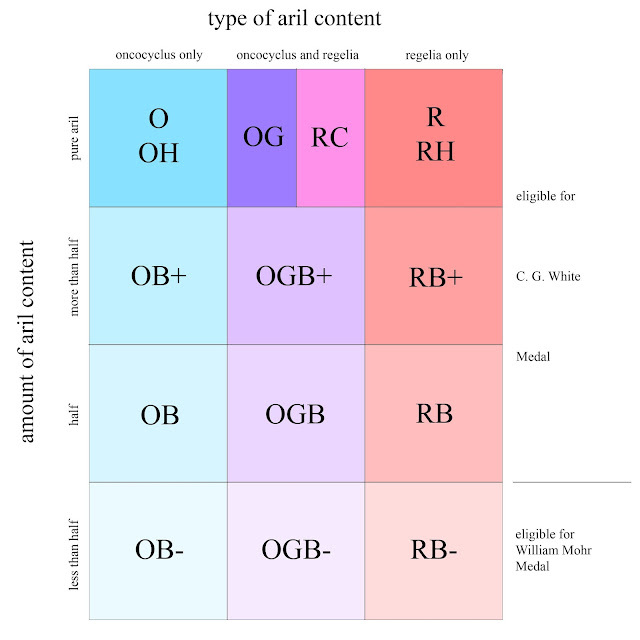 So all together that makes nine types of arilbred: OB-, OB, OB+, OGB-, OGB, OGB+, RB-, RB, and RB+. A point to note is that since 1990, the amount of aril content is based on chromosome sets, not parentage (which is why the word "content" is used rather than "ancestry"). Although the distinction between chromosome content and ancestry often makes no difference, there are times when it does. 'Loudmouth' (Rich, 1970), for example, came from a cross of an oncocyclus with an SDB. Thus it is 1/2 aril by parentage. However, the oncocyclus parent was a diploid, providing only one set of aril chromosomes, whereas the tetraploid SDB parent provided two sets of bearded chromosomes, making 'Loudmouth' only 1/3 aril by chromosome content. It won the C. G. White award under the old parentage system, but today it is classified as OB-, and would not be eligible for that award. Despite all this attention to detail regarding the aril ancestry of arilbreds, no distinctions at all are made regarding the type of bearded ancestry, whether TB, dwarf, or median. Sometimes smaller arilbreds with dwarf or median ancestry are called "arilbred medians", "aril medians", or other similar terms, but these are not official categories. I hope this post has shed some light on a rather complicated subject. Do you find these categories helpful when choosing and growing arils and arilbreds? Very informative article. Thank you. I love reading this blog for information and inspiration (i.e. gorgeous pictures) on irises. Could someone point me to a good discussion group or forum for arils and arilbreds? I'm interested in growing these and would like to learn from other growers, especially those in my region. The Yahoo group that's listed on the ASI website seems not to be active. Thank you in advance.